People are always saying that there is so much trash in modern literature. I disagree. Yes, there is some pretty horrible stuff out there. But I’m pretty sure that there has always been sub-par literature and readers in Dickens’s day had to sift through the junk to get to the ones we consider classics now, just like we current day readers have to really search for the good stuff. It would be tragic to be a true Old Book Snob like the father figure in The Precious One who wouldn’t let his daughter read anything written after 1900. Who would want to miss out on The Help, To Kill A Mockingbird, The Hitchhiker’s Guide To The Galaxy, or worse, Harry Potter!?!? But I have to admit…old books are my favorite. And that’s why I am totally in love with The Bloomsbury Group. It was launched in 2009 and publishes “lost classics written by both men and women from the early twentieth century.” Thanks to The Bloomsbury Group, I discovered a new favorite author and am in the process of refreshing my bookshelves with some beautiful paperbacks. Right now I’m in the middle of Henrietta’s War. I love the writing style and the lighthearted tone of Joyce Dennys as she writes about her experiences of being on the home front in WWII. Before you go saying, “great, another WWII book,” please know that the books actually written during the war in Britain are so very different from the ones being written now. For one thing, the worst about Nazi Germany was not yet known. For another, they did not dwell on the tragedy because life became normal even in the midst of war. I never do Spring Cleaning. I know I should and every year am filled with a longing to do better and rush round the house emptying drawers and shelves on to the floor and unearthing many treasures such as my dark glasses (mourned as lost) and endless snapshots. After enjoying several holidays in retrospect I somehow lose heart and bundle everything back again. My sentiments on Spring Cleaning exactly. 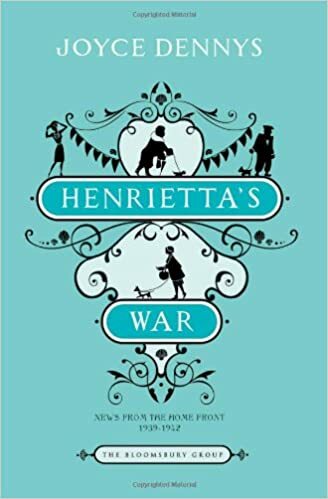 If you loved The Guernsey Literary and Potato Peel Society as much as I did, definitely check out Mrs. Tim of The Regiment, Henrietta’s War, and Miss Pettigrew Lives For A Day. They’re perfect for light reading without feeling like your mind is going to mush. I completely agree with you on how not everything that you said about new books and old classics and wadding through all the stuff between. There are a lot of not so great books out there but it is worth it to read through them in search of fantastic books. I personally read a lot of books that people put down in horrible ways and really loved them because of their unique views on subjects that were already talked about. Similar to the book you mentioned -which by the way thank you will put that on my TBR list to get because it sounds fantastic!- about a good known topic but from a different viewpoint. I’d never heard of the Bloomsbury Group, but it sounds wonderful. I’ll have to check them out now, thank you! Previous post What Books Become Part of Your Life?